Pınar, the leader food brand of Turkey, supports the environmental project “Little Things Renew the Nature”, carried out in cooperation with the Ministry of National Education, the Istanbul University and Tetra Pak, to explain the importance of renewable resources to the new generations and to train on how to conserve the nature. In the trainings within the scope of the environmental project “Little Things Renew the Nature”, the economical use of natural resources are explained to primary school children and the importance of renewable resources is underlined. These trainings aim to establish the habit of collecting the packaging wastes separately from other wastes in the students so that they can be circulated into recovery. How to conserve the nature is demonstrated through little efforts and touches. 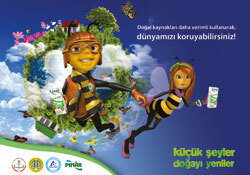 As the students listen to expert teachers on subjects concerning environment and recovery, two lovable bee characters, Kaşif and Yaprak accompany them. After watching animations with recovery themes, the students find the opportunity to experience the recovery process using the recovery sets consisting of 3 stations established in schools. Within the scope of the project, recommendations are given to parents on how to support the training given to the children at home and on to value the suggestions of the children within the framework of the trainings. The “Little Things Renew the Nature” project, launched by the leader company of the world in food processing and packaging solutions, Tetra Pak, under the auspices of the Ministry of National Education in 2004, and continued with the contribution s of the Istanbul University, has accessed over one million students up to now.